MOUNTAIN RANCH, Calif. (KGO) -- Crews are making progress on the Butte Fire burning in Jackson, southeast of Sacramento. So far the fire has destroyed 252 homes and claimed two lives since it broke out last Wednesday. Officials say two men who refused to leave their homes died in the community of Mountain Ranch. That's not surprising to the people who live there. 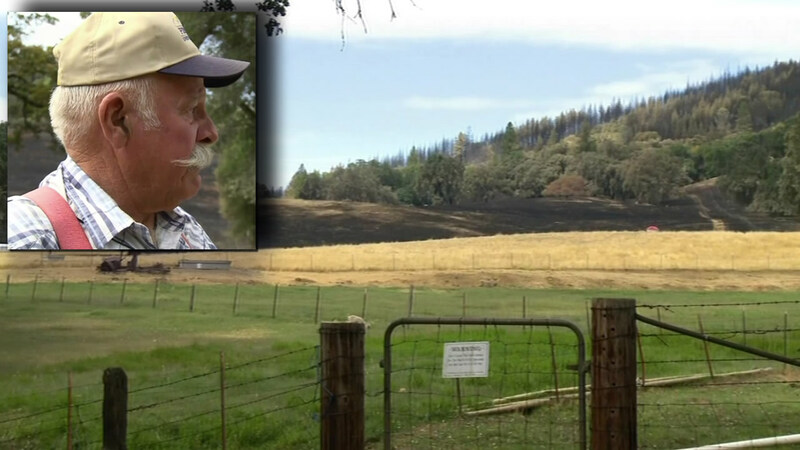 In fact, several ranchers teamed up to stop the fire from spreading through the small Calaveras County town. "This one that came this way was the one that hit us, that one came up and it split and went around us," Doug Joses said. "Everything you see right here, we stopped. None of us were scared, it was just a fight," Jeremy Leonard said. "We are the people of Mountain Ranch, saved it, if it wasn't for that, the community did it," Joses said. The Butte Fire has burned nearly 71,000 acres and is now 49 percent contained. Officials say at least 6,400 structures that remain threatened. The cause of the fire is under investigation, but PG&E officials strongly believe the fire started when one of its power lines came into contact with a tree east of Jackson in Amador County. For more stories about the wildifires burning throughout California, click here.